Before the start of the Texas Hold'em boom a couple of years ago, Stud had always been the most popular poker variation in the United States. The game is played with two to eight players. Seven Card Stud 8 or Better is a high/low game. The high should be pretty obvious to most players, as the hand rankings are identical to those in Texas Hold'em; a flush beats a straight, trips beat two pair and so on. Something beginners often need some time to get used to is the idea of the low hand. A low hand is not a definite combination of cards. If you are holding two pair, you immediately know that you are holding two pair, but recognising a low hand can be a little bit more complicated, because a low hand consists of any 5 unpaired cards with a value of 8 or lower (Ace counts as high and low). 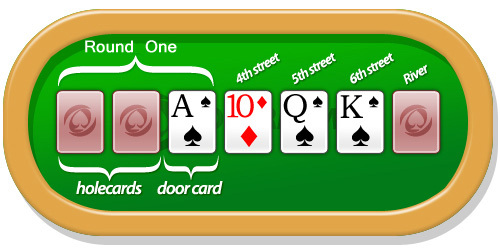 A low hand can be made with any 5 cards of the card group below, but all five cards have to be of different value. The best Low hand is always the hand with the lowest 'high' card. In the example above, it doesn't take very long to see that Player 2 has the best hand here. This is obvious because his highest card is a six, while the other two players both have a 7 as their highest card. To decide who wins between Player 1 and Player 3, you look at the next highest card. Here we see Player 1 holding a five and Player 3 holding a six, so Player 1 has the better low hand.